Although the three titles in the Revisitations 2 boxset don't strike me as in great need of sprucing up, I'm happy for the excuse to revisit my covers for the stories. And while I'm pleased with the compositions of the originals, my technique was still developing back then and there are some rough edges I'm pleased to tidy up. I've kicked off with 'Resurrection' as I felt there was no need to rethink any of the images in this one, just to redo some with my now more advanced Photoshop skills. 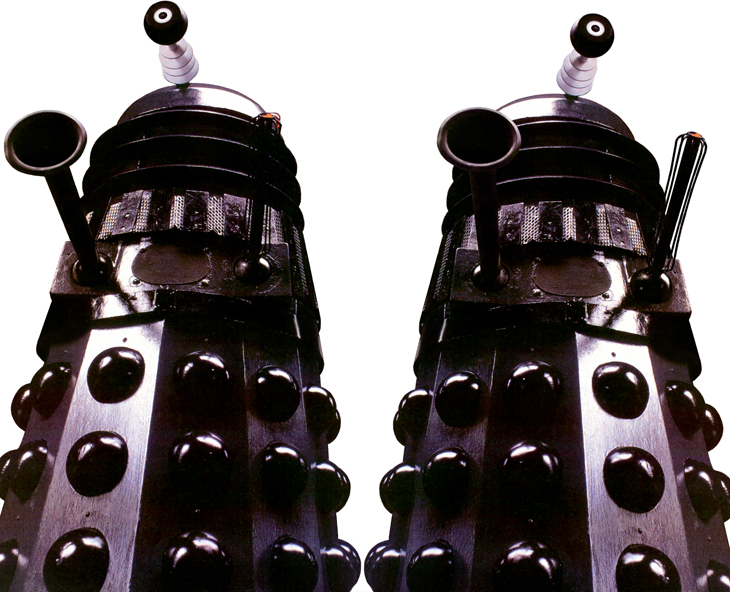 Having said that, the only element that has remained exactly the same is the Dalek. I was rather proud of my original work on this, which involved reversing the photo and therefore I had to switch back the gun and sucker arms. This was pretty straightforward, with the sucker simply covering up where the gun was, and the old sucker obscuring only a small area of the body so needing just a little painting out. My original before and after images are shown below. Actually, I did make one small amendment to the Dalek in the revised cover: I painted out some of the ugly bolts on its skirt section. 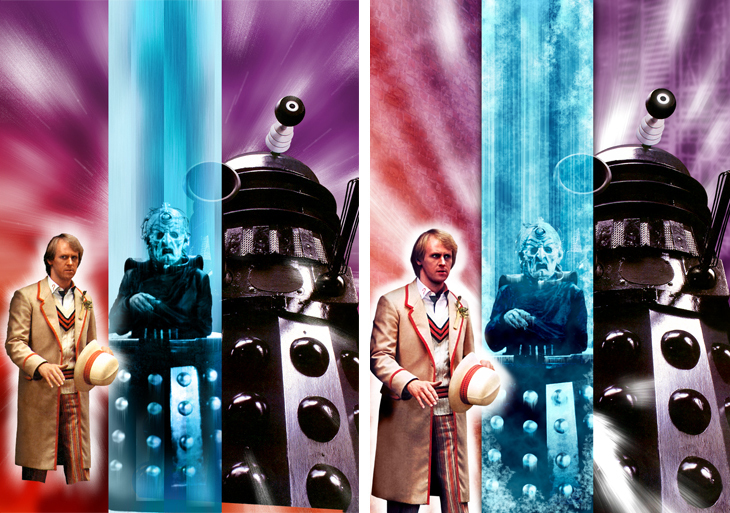 Davros I redid from scratch. I used the same shot as originally, unable to find a better quality image than the one from DWM I used first time round, but rescanned and newly cut out and tidied up. The ice hanging off him was done in the same way, however: rotate the image 90 degrees, apply the Wind filter to selected highlights, then rotate the image back. I also recreated the blue strip representing his prison cell with better texturing and added frost. The Doctor was done from scratch as well, although again using the same photo as before. Oddly, it seems that despite having a good-sized original to work from, I originally scanned it at the size it'd be on the final cover, losing a degree of detail. This time I scanned it at full size, worked on this, then sized it down for the cover as I now usually do, thereby preserving detail and sharpening softer edges in the reduction. This time I also decided the Doctor really needed to be looking into the cover at the other figures, so repositioned his eyes. Finally, while I wanted to keep the feel of the original background, I was disappointed with the flatness of the colours, so this time I added some texture, with brickwork behind the Doctor and detail of the spaceship sets behind the Dalek. Compare the original (left) and remastered illustrations below.